The pizza was thick crust, cut into squares and generously topped. It was terrific. A medium fed four of us (we also shared a spaghetti) and two of us took slices home. The ambience is old-school Italian pizza parlor, reminiscent of Casa Bianca Pizza in Eagle Rock. The pressed-tin ceiling adds character, as does the lovely neon sign glowing outside. There are other Petrillo’s locations, including Glendora, and a couple of offshoots whose connection to the real thing I’m unclear on: Mama Petrillo’s, with a location in La Verne, and Petrillii’s, a takeout-only spot in Upland that may be a former Petrillo’s. I think it was 1966 when I first had Petrillo’s. Have been to the one in La Verne a couple of times and it’s very good. My college years and my years in DeMolay found us many times at Petrillo’s. It has been named the best pizza in So. Cal. many times. We used to take groups there for their large everything pizza and a large antipasto. Everyone chipped in and hardly paid anything and feasted on the wonderful food. 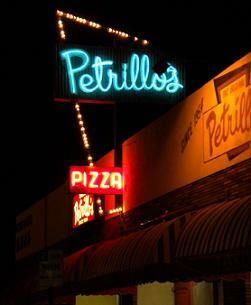 The old place in San Gabriel is truly the only place to experience Petrillo’s pizza.